Dylan Ratigan is the former host of MSNBC’s The Dylan Ratigan Show, which aired from 2009 to 2012. The show met with much success and gained viewership year over year, even as other network news shows were losing it. A political firebrand, he is a frequent guest on and contributor to several news/current events outlets, and has been pushing for some time now, to get money out of politics. Not tied to any specific political party, Ratigan routinely dishes out criticisms against both Republican and Democratic establishments. His demeanor can range from calm and collected, to downright aggressive (though never vitriol, as is the case with several political shows). 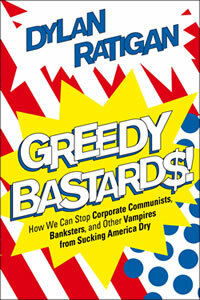 In 2012, Ratigan published his views in the form of a book titled Greedy Bastards. In this book, he argues that traditional capitalism (where companies generally profit and grow by providing valuable products and services) has largely been supplanted by what he calls extraction (whereby companies are largely profiting by gaming loopholes in lax regulations, often made possible by cozy relationships with politicians). Ratigan includes several examples, such as deregulation that has allowed banks to continue to gamble our deposits in the shadow finance sector and an auto industry that ceased to compete in the MPG game because there was more money in marketing SUVs and even participating in the finance sector itself. Dubbing this relationship “The Unholy Alliance,” Ratigan leaves us with several paths forward, including the requisite of getting money out of politics. Unlike partisan ‘exposé’ books which purport to expose corruption but are little more than partisan propaganda which exaggerate corruption on one side and avoid scrutinizing the party the author obviously favors, Ratigan has no political ties and is free to unload on both major parties. Unlike ‘exposé’ books which go after both parties because neither party favors the author’s irrational and unworkable ideas, Ratigan’s criticism is based on practical solutions clearly in reach, but often blocked through corporate lobbying efforts. Rather than merely ranting that we have too much government or too much privatization, Greedy Bastards reads like an objective case study with practical outcomes (not ideology) as its objective. As such, it is a breath of fresh air that will also get your blood boiling (unless you have no pulse).